To my surprise yesterday I received a notification on my phone from USPS that the package I had given up hope of ever receiving was left it my front door. 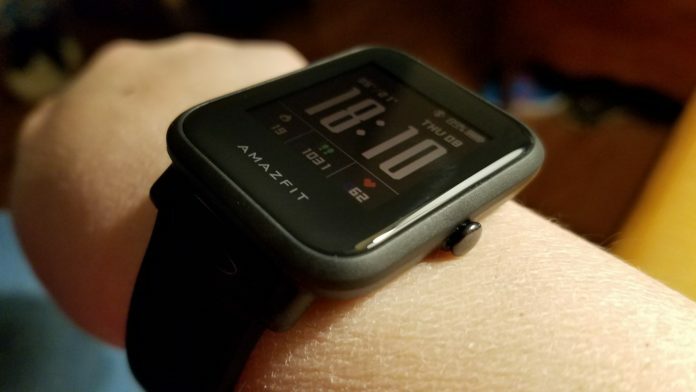 The package contained the Amazfit Bip available on Amazon that had made the long journey from China to Illinois. Now I’m going to have two of these things because I had pre-ordered the English version from the Amazfit website last week. This one is the international version which supports English but many of the watch faces only support a 24-hour format and that’s fine until it gets past noon and then I have to do math in my head to figure out what time it is. Ha! But there are some watch faces that do support the 12-hour format so I don’t have to rack my brain too hard. 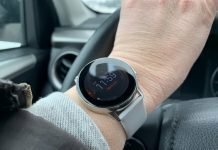 Anyway, this is going to be a mini-review of the Amazfit Bip and my initial thoughts. My first impression when I opened the box and saw the watch was, “Wow, it looks a lot like the Apple Watch!” The resemblance is hard not to notice. While it certainly looks like the Apple Watch at first glance, the screen is more reminiscent of the Pebble Time. The Bip is very lightweight and supported by a good quality silicone band. A single button is on the right side of the watch. After pressing it, I’m able to then swipe through the various menus on the touch screen which is not the most responsive screen I’ve used but fine. Even though the watch had been in transit for over a month, it still had 92% of its’ battery left even after 30 minutes of firmware updates. This morning it is at 86% and that’s after a 40-minute workout on a treadmill, a short test of the GPS, and me trying out different watch faces. I also have continuous heart rate detection enabled to measure every 1-minute. After I’ve tested the HR accuracy, I’ll be reducing the frequency to every 10 minutes. 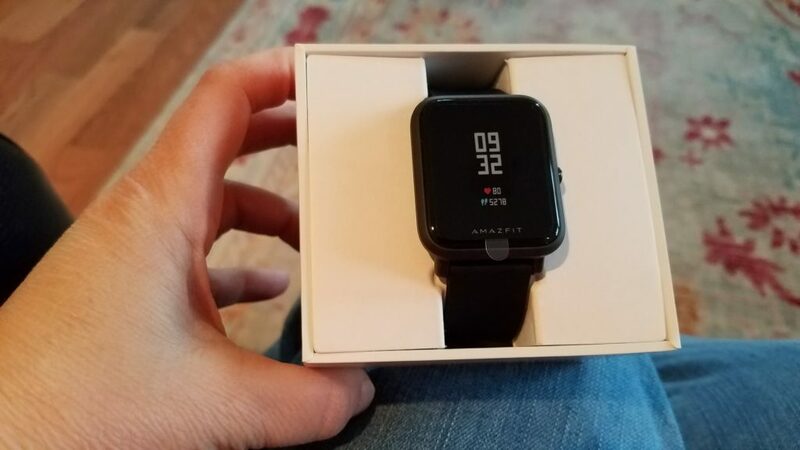 The box didn’t come with any literature or manual so luckily I had already read up on the Amazfit Bip and knew that it synced with the Mi Fit app. The process of syncing the watch to my phone went quickly and then it downloaded those updates. The Bip comes with a charging cradle but you shouldn’t have to use it too often considering its battery life. Now that I’ve owned watches with long battery life like the Garmin Fenix 5s, it’s hard to go back to those watches that only last 24 hours, even if they have a lot cool features. It didn’t used to bother me to charge a watch every day. Now it does. My initial impressions so far after less than 24 hours is that I love the size, weight, and look of the watch. This little watch packs both GPS and GLONASS which is pretty amazing considering the price. The heart rate sensor is doing a great job for my resting heart rate as I compare it to the Garmin Fenix 5s and it did okay but not great on the treadmill last night but did wonderful on a hike this morning. Both the GPS and HR sensor were accurate on an outdoor walk. I was really impressed with it and I love when that happens. Notifications are coming through fine and Bluetooth is staying connected and reconnects when I come back within range. Sleep tracking wasn’t the best on the first test. That might be a shortcoming but I’ll be testing it more. The display is very readable in most lighting conditions. It does have backlight for those darker conditions but it looks good in the bright sunshine for sure. The activities it supports is limited to outdoor running, treadmill, cycling, and walking so hopefully future updates will support more activities. So if your primary workouts involve walking, cycling, and running then this watch is for you. 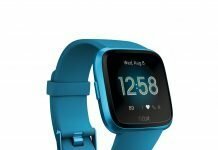 The Amazfit Bip is now available on Amazon for $99 and is eligible for Amazon Prime so hopefully you won’t have to wait long for it like I did. 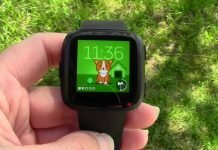 There’s also some nice accessories available to personalize the watch as in some stylish straps and protective bumper shells for the screen also both available on Amazon. But it will also support any 20mm wide strap and comes with a quick release band which makes it very easy to change out. So, you can really add some character to the watch which I like. I think teenagers will love this about it. So far I would give the Bip a thumbs up. Anyway, check back for the full review. I’ll be putting it through the paces like I do with every watch I test.